...and I'm going to have to put something like that sticker below on my car. 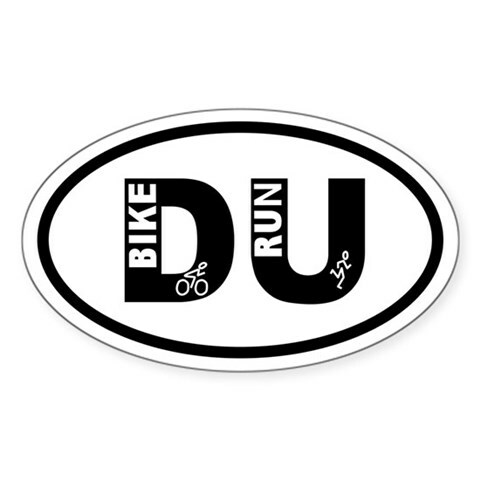 Today I completed my last long run (13+ miles with my local running buddy--who I'm pretty certain is now confident in her ability to complete our planned 25k race in 4 weeks) before the race, tomorrow I will be doing an easy 29 mile group ride with the JDRF crew, then Monday my last tough bike ride before starting a sort of "taper" leading up to race day. I get a little nervous thinking about the race...not the running parts, but the biking parts and the transitions. Mostly I fear crashing--either by myself or into another cyclist (thus ruining both of our races). Or the possibility of mechanical issues or flat tire. Or simply doing something completely moronic and humiliating like forgetting to take my helmet off after the bike portion and running my last 3.1 miles with a dorky helmet on my head. Seriously, I would not put this scenario out of the realm of likely outcomes. I know myself too well. Hey, you will do just fine! Good work with all that training on both pedals and feet. The first race will be nerve wracking but great fun at the same time. Thanks, Ian! By now I should be used to that nerves thing before any "new" sort of race/distance.